President Obama spoke at the conclusion of the NATO summit in Wales on Friday, announcing the alliance's continuing and increasing support for Ukraine, while stressing the organization's commitment to defeating the Islamic State in Iraq. We've met at a time of transition and a time of testing... Russia's aggression against Ukraine threatens our vision of a Europe that is free and at peace." In his remarks, which came just an hour after a cease-fire went into effect in Ukraine, Obama discussed the creation of a NATO "rapid response force" to monitor the situation and intervene should pro-Russian separatists break the cease fire. The President also announced increased sanctions against the Russian economy. Today the United States and Europe are strengthening our sanctions against Russia's financial, energy, and defense sectors." The two-day meetings in Wales have been described by experts as one of the most important NATO summits since the end of the Cold War over two decades ago, and the President strongly stressed article 5 of the NATO charter, which he described as "an armed attack against one should be considered an attack against them all." 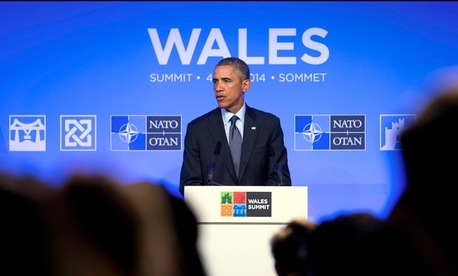 Obama also commented on both NATO and the United State's commitment to addressing the threat posed by ISIL. Echoing previous language, the President said that the U.S. plans to "degrade and ultimately destroy ISIL." He continued to stress a systematic approach to dealing with the terrorist organization, which he said would involve degrading ISIL's capabilities and taking out their top leadership. Obama pointed to using a similar strategy against the Islamic State that the U.S. has used against al-Qaeda, which, he confirmed, recently resulted in the death of Ahmed Godane, the leader of the al-Qaeda affiliate in Somalia, al-Shabaab. You can't contain an organization that is running rough shod through that much terroritory... The goal has to be to dismantle them... You initially push them back, you systematically degreade their capabilities, you narrow their scope of action, you slowly shrink the space they may control, you take out their leadership and over time they are not able to conduct the same kinds of terrorist attacks that they at one time could." The President said Secretary Kerry will travel to the Middle East to continue building a "broad coalition" to take on the threat posed by the Islamic State.